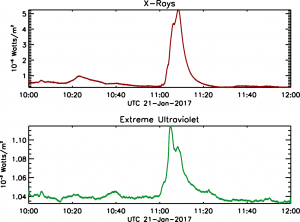 On January 21, 2017, the LASP-built Extreme Ultraviolet and X-Ray Irradiance Sensors (EXIS) on the National Oceanic and Atmospheric Administration (NOAA) GOES-16 satellite observed solar flares. Solar flares are huge eruptions of energy on the sun and often produce clouds of plasma traveling more than a million miles an hour. When these clouds reach Earth they can cause radio communications blackouts, disruptions to electric power grids, errors in GPS navigation, and hazards to satellites and astronauts. The EXIS instrument measures solar flares at several wavelengths and improves upon current capabilities by capturing larger flares, measuring the location of the flares on the sun, and measuring flares in more wavelengths. The GOES-16 EXIS will provide forecasters at the NOAA Space Weather Prediction Center with early indications of impending space weather storms so they can issue alerts, watches and warnings. Current geostationary satellites measure solar X-ray and extreme ultraviolet fluxes. The higher resolution EXIS instrument will provide new capabilities, including the ability to capture larger solar flares. 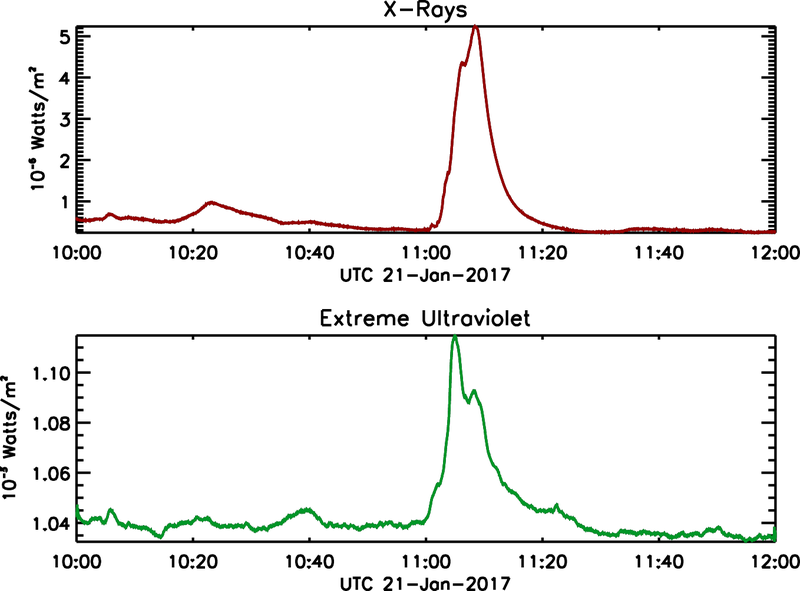 The figure shows an example of EXIS observations at two different wavelengths of a flare that peaked at 11:05 UTC [6:05 a.m. EST] on January 21, 2017. This is a relatively small flare, yet the brightness of the sun in soft (lower energy) X-rays increased by a factor of 16. EXIS will give NOAA and space weather forecasters the first indication that a flare is occurring on the sun, as well as the strength of the flare, how long it lasts, the location of the flare on the sun, and the potential for impacts here at Earth.